Smells and tastes associated with foods are often evocative of certain significant times in our lives. I still feel like I can smell and taste the fragrant chicken and corn on the cob my parents made on their grill the day I got engaged. But sometimes food isn’t just part of a moment in one’s life, it can be the catalyst for change. In all three of these memoirs food was a motivation for the authors to find themselves and to transform their lives whether it was through cooking, baking, or even growing crops. 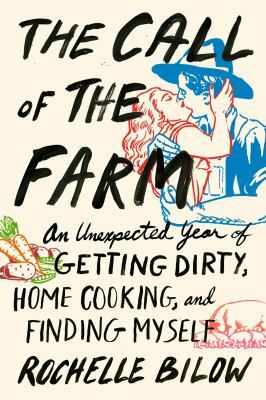 The Call of the Farm: An Unexpected Year of Getting Dirty, Home Cooking, and Finding Myself: A Love Story, with Recipes, by Rochelle Bilow. I grew up in rural Central Jersey before moving further north and closer to the city. Although I had classmates who lived on dairy and pig farms, I still had only a vague idea of all that went into farming so I understand the curiosity Rochelle Bilow had about farm life. Bilow’s father grew up on a dairy farm, but she herself only had minor experiences with rural living when visiting her uncle and cousins who now run the place. In her years after graduating school and getting a culinary degree she struggled to get by with freelancing jobs as a food writer. An assignment from a local paper brought her to a small CSA (Community Supported Agriculture) farm in Central New York. She was intrigued by what she saw at the farm with both the emphasis on sustainable local food and the camaraderie amongst the farmers (one in particular catches her eye). She starts volunteering and then gets hired part time and moves onto the farm where she learns not only about how to plant a variety of crops and care for livestock, but also about herself. Although throughout The Call of the Farm, one senses this love story may not have a happy ending, there are many sweet, funny, and touching moments. The Call of the Farm is divided into seasons with recipes that take advantage of fresh produce. Check out her book at the Hoboken Public Library today or you can also read more of Bilow’s writing in the magazine Bon Appetit, which the Hoboken Library subscribes too. Although urban Hoboken seems removed from farm life we are only an hour or two away from some great New Jersey and New York farms with amazing local produce. I love cheese, so my two favorite local farms to visit are Valley Shepherd in Long Valley for their fabulous sheep’s milk cheeses and Bobolink Dairy in Milford who has tasty cow’s milk cheeses and wood-fired breads including their amazing bread with garlic roasted in duck fat. 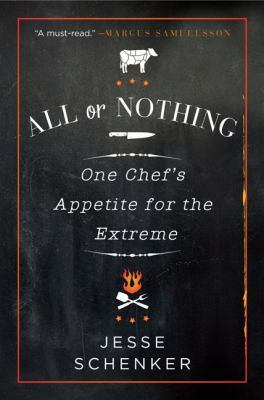 All or Nothing: One Chef’s Appetite for the Extreme, by Jesse Schenker. Jesse Schenker is well known for his New York restaurant Recette as well as his recently opened The Gander. He won his battle on the cult TV show Iron Chef America, but even more impressive in All or Nothing is the battle he won against drug addiction. From an early age Schenker was obsessed with food (a peanut butter and jelly French toast he created as a kid is now in a more refined form a PB&J “Pain Perdue” on his brunch menu at Recette). But unfortunately his restlessness and nervous energy led him to self-medicate as a teen with a variety of drugs. His parents, while loving, were in denial about his behavior and he gradually spiraled further and further into addiction. I found some of All or Nothing almost painful to read with its vivid, unflinching descriptions of his life as a junkie which eventually lead him to jail time. Rehab while in prison leads him on the path to recovery, but it is cooking that gives him a new drive, leading him to a successful job at one of Gordon Ramsey’s restaurants and then on to a successful pop up and then a place of his own. In less than ten years he went from living on the street to being a successful, award winning chef. I thought it was interesting to see how some of his skills hustling to get by on the street helped him with dealing with the trials of the restaurant industry. No recipes are included, but each chapter in All or Nothing is based on a different cooking technique, with its definition, that correlates to its contents such as “coddled” for his childhood. I found the way Schenker rebuilt his life was inspirational and his descriptions of food mouthwatering (I was left wanting to make reservations to check out Recette in person). You can borrow the print book from BCCLS libraries or the eBook from eLibraryNJ. Originally published under the title: Confections of a Closet Master Baker: One Woman’s Sweet Journey from Unhappy Hollywood Executive to Contented Country Baker, by Gesine Bullock-Prado. Gesine Bullock-Prado is probably most famous for being the sister of popular actress Sandra Bullock, but she has plenty to be proud of in her own right. She graduated from law school and for years she put her legal knowledge to use by reviewing contracts and helping to run her sister’s production company. At some point though she got tired of Hollywood’s façade and moved to Vermont where she started her own bakery specializing in macaroons and a variety of mouthwatering pastries and other dessert treats. The original title to Bullock-Prado’s memoir pokes fun at the fact that in image conscious Hollywood, loving to bake seemed more taboo than an eating disorder. Each chapter looks at a different portion of her day, from opening to closing the store, which triggers memories from her past. Some of my favorite parts of My Life from Scratch were when she described funny stories from her childhood with her opera singer health food obsessed mom. She also captures insider looks at both less than glitzy Hollywood and quirky Vermont that few visitors get to fully see. Bullock-Prado depicts herself as a bit misanthropic, but her warm feelings for her regular customers and her family shine through. Gesine Gourmet and Confectionary closed in 2008, but throughout My Life from Scratch are recipes for sweet treats including Starry, Starry Nights decadent sounding chocolate cookies that you can bake at home. Besides Confections of a Closet Master Baker, Hoboken library card holders can also borrow her cookbooks Bake It Like You Mean It and Pie it Forward from BCCLS libraries. 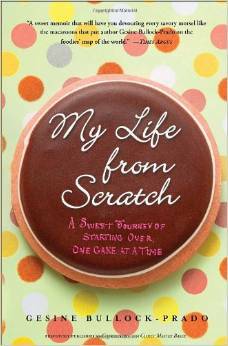 Those who prefer eBooks can borrow My Life From Scratch, Pie it Forward, and Sugar Baby from eLibraryNJ. Plus you can check out her blog G Bakes! for more culinary inspiration. Have you ever wondered what the pumpkin juice served on the Hogswart Express would taste like or maybe wanted to savor the exquisite hot chocolate served in the Capital in the Hunger Games? Or perhaps you are curious about the cocktails that would be served at Fangtasia? There are plenty of mystery series that include at the end a few recipes from their crime solving chefs, but despite the intriguing dishes found in many fantasy novels, those treats are mostly left to our imagination. In these three cookbooks, however, the authors have transmuted dishes that previously only existed in our minds to something that we can make and taste for ourselves. These dishes would be great for a fan’s themed birthday party or a special book club meeting. Some recipes even sound good enough to make a permanent part of your cooking repertoire. As well as being available in print, all three of these books are available to Hoboken Library Card Holders as eBooks through eLibraryNJ. Library card holders can borrow the books that inspired the recipes as eBooks too! 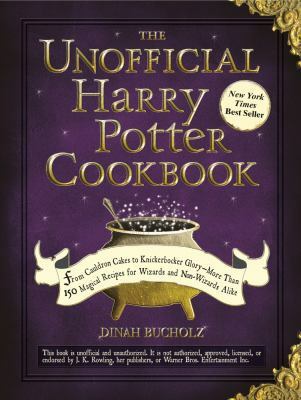 J.K. Rowling’s Harry Potter series is filled with mouthwatering food so I was curious to take a peek at Dinah Bucholz’s Unofficial Harry Potter Cookbook to see how she recreated the dishes from the novels. This cookbook will be enjoyable to nonfans of the series, who are anglophiles, since many of the foods included are classic English dishes recreated. I loved the peppermint humbugs I tried when I was visiting London, and will be curious to try to recreate them from Bucholz’s recipe next Christmas. I was actually surprised to learn how many things were not purely from Rowling’s imagination, but had basis in commonly eaten English treats such as the Fizzy Sherbert Pouches–the ones you can make at home unfortunately (or fortunately) won’t lift you off the ground like in Rowling’s books. Recipes include food from Harry’s time living with the Dursleys, at Hogwarts, on the Hogwart’s Express, in Hogsmeade, and in Diagon Alley. The recipes are organized by these locations rather than by types of dishes. Accompanying text for recipes includes not only where the mention of the food the recipe is based on can be found in a particular chapter, but also some historical background such as the origin of foods including hamburgers, ice cream sundaes, and pasties. Older children will enjoy reading more about the dishes and helping their parents in the kitchen recreating some of the treats. Emily Anasara Baines is a former professional baker and caterer who is also a huge Hunger Games fan. Suzanne Collins’s trilogy sets up an interesting contrast with food that highlights the disparity between those living in the capital with those in the districts. Baines describes the symbolic role that the food takes on in the series and her book gives a helping of literary interpretation with each recipe leading the reader to come away with not only some delicious recipes, but also a richer understanding of the novels. Be warned though the author is very fond of puns, perhaps even more than I am. 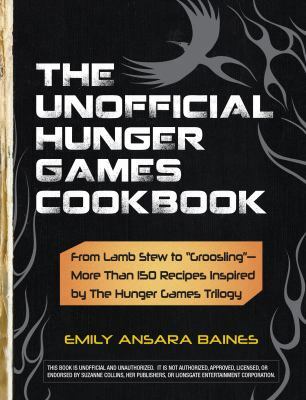 Some of the foraging and hunting based recipes such as those using katniss roots and raccoon meat were less than appealing to me, but if I had the time I would love to try all the different bread recipes she featured which include the breads that represent each of the districts in the book. One clever addition to each recipe are the “tips from your sponsor” that have useful hints such as using crescent rolls for a pie crust if you don’t have time to make your own, a substitution for when you don’t have buttermilk on hand, and using dental floss to more easily cut cinnamon buns. I found Baines’ baking advice particularly helpful. These clever and resourceful hints would make Katniss proud. This cookbook is based on the television series more than Charlaine Harris’s Sookie Stackhouse novels, however, fans of the novels who didn’t necessarily watch the show will still enjoy trying these recipes inspired by Fangtasia, Merlotte’s and the Southern Style cooking practiced by many of the book’s characters. 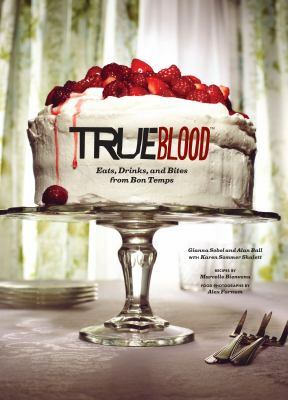 The book is written as if it is a collection of recipes from the True Blood characters and everyone from Sookie to Debbie Pelt introduces different recipes all of which have quirky pun filled names. Since I love Cajun food, this cookbook had a variety of recipes I’d like to try especially those featuring my favorite crayfish such as crayfish fritters and crayfish dip. Since this book unlike the previous two, is an “official” work it includes a variety of color photographs from the TV series, which will be a delight to fans of True Blood’s eye candy. For those budding mixologists there is a sizable cocktail section (including a Bon Temps spin on the bloody mary) reflecting that this is a very adult series. My husband once tried to create “True Blood” for a viewing party we held by combining everything from Chambord to Jägermeister. It very surprisingly tasted pretty good considering his goal was looks not flavor, but I think we might try recipes from this book this summer when the final season of True Blood airs. You can catch up on the previous seasons with the DVDs available at BCCLS libraries. You may also want to check out The Sookie Stackhouse Companion by Charlaine Harris, which includes recipes inspired by the books series.